Histology is used to identify structural details of tissue on the microscale in the pathology laboratory. However, the analyzes remain two-dimensional (2D) because they are constrained to the same level. Non-destructive 3D technologies, including X-ray micro and nanocomputed tomography (NanoCT), have proven to be useful in understanding anatomical structures, allowing for any angle of view and 3D structure detail. However, the low attenuation of soft tissue has hindered its application in the field of virtual 3D histology. In a recent study, Scientific Reports Mark Müller and colleagues from the Department of Physics and Bioengineering developed a hematin-based X-ray staining method to specifically target cell nuclei, followed by demonstrations on a nucleus of a mouse's liver globule. The novel staining protocol combined the recently developed high-resolution NanoCT system for the 3D visualization of tissue architecture in the nanometer range. The results showed the real 3D morphology in addition to the spatial distribution of cell nuclei. The technique was also compatible with conventional histology, as soft tissue microscopic slides could be stained with the same protocol in addition to the additional counterstaining. The method demonstrated the potential for future applications in histopathology in conjunction with X-ray CT equipment in the laboratory. Histology is the existing gold standard for accurate microanatomical diagnosis in the pathology laboratory, however, techniques and results are limited to 2D. For example, a 3D biopsy is usually examined using very thin microscopic slides (containing 2-10 μm thick slices) by conventional and modern immunohistochemical and histological staining procedures. Micro and nano-CT are powerful tools that enable accurate reconstruction of tissue in 3D. The development of the technology has allowed comparatively high resolution over traditional 2D histology, using devices ranging from large particle accelerators to X-ray laboratory equipment. In addition to the technical requirements, X-ray-suitable colorants (contrast agents) such as phthalic acid (PTA), iodine potassium iodide (IKI), iodine in ethanol (12E) or iodine in methanol (12M) are also important. However, the available colorants are currently limited in scope and effectiveness. In the development of next-generation medical diagnostics in histopathology, scientists are attempting to optimize techniques and understand tissue architecture from the cellular level to the tissue scale. CT sections of the same whole liver flap from mice before and after staining highlighting the contrast enhancement obtained after application of hematin-based X-ray staining. Both data sets were recorded with the Xradia Versa 500 microCT with identical acquisition parameters. The voxel size in both data sets is 13.5 μm. (A, C, and E) Overview images of the unstained mouse liver lobe depicting the views along the Cartesian axes. (B, D and F) Overview images of the same mouse liver globule sample in (A, C and E) after staining, representing the views along the Cartesian axes. Anatomical structures such as the vascular system are visualized. Photo credits: Scientific Reports Doi: https://doi.org/10.1038/s41598-018-36067-y. At the first diagnosis in clinical pathology, the nuclei and the cytoplasm are important. Almost every histological sample is therefore often stained via the standard protocols hematoxylin and eosin (H & E) to identify the nuclei and the cytoplasm. However, standards for hematoxylin staining are not established, and there are many variants of the protocol due to various tissue types and / or pretreatment parameters. As a result, Müller et al. Introduced a hematin-based staining protocol designed specifically for CT that allows direct 3D visualization of nuclei in soft tissue samples. The strong potential of microCT or nanoCT in combination with x-ray-enabled stains allows future knowledge about the tissue structure to understand diseases such as osteoarthritis and cancer in cellular nanoarchitecture. In the development of the new X-ray-appropriate hematin-based staining, the commonly used Mayer hematoxylin and the Wiegert iron hematoxylin were included in the constitution. 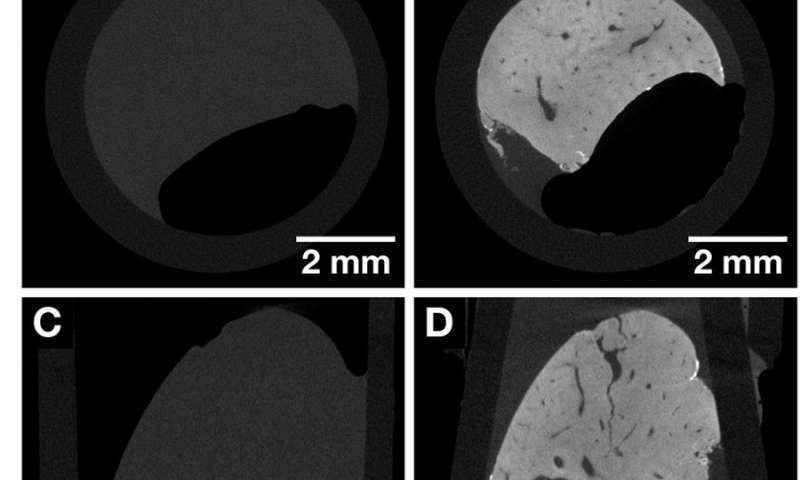 Staining experiments were performed on mouse liver flap tissue, which was subsequently used for X-ray CT imaging. The optimized staining protocol included five steps, starting with the controlled acidification of soft tissue samples during fixation. The soft tissue was prepared at the molecular level to stain with the hematin-lead (II) complex. 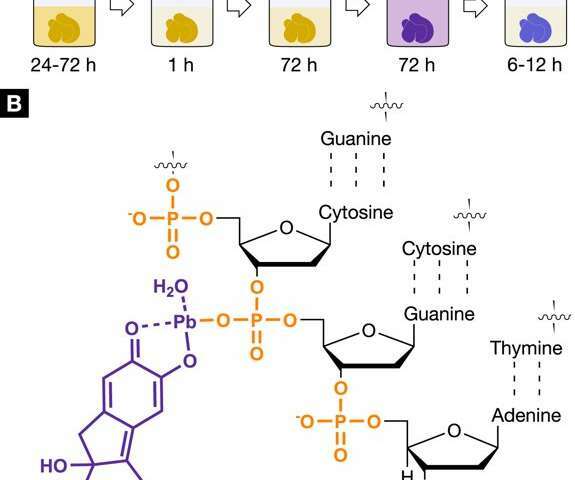 The mechanism of action demonstrated an enhanced ionic interaction between the positively charged hematin-lead (II) complex and the negatively charged phosphate backbone of deoxyribonucleic acid (DNA). 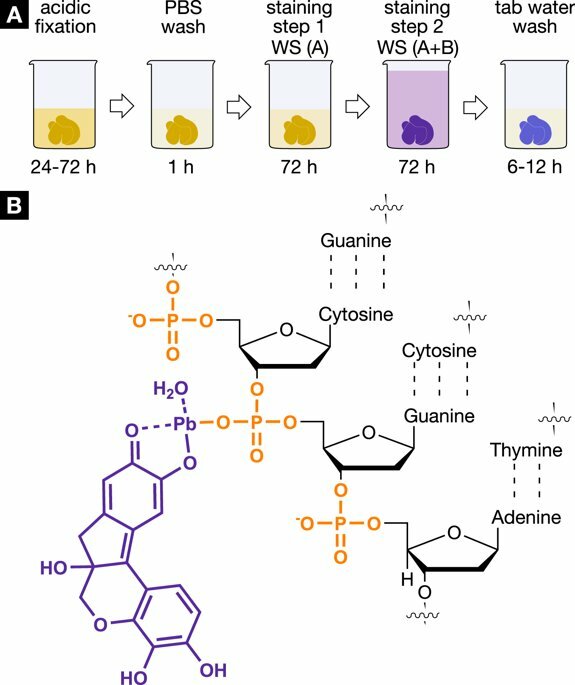 The chemical reaction ensured a higher accumulation of the stain within the cell nuclei by forming a hematin-lead (II) -DNA complex as an X-ray suitable agent. NanoCT data (A – C) compared to the histological slide (D) derived from the same mouse liver globule after application of the X-hematin staining protocol. Clear visualization of the larger hepatocyte nuclei and smaller nuclei such as Kupffer cells and SECs in white (A-C) or dark purple (D) and the BC network in black (AC) or white (D) were achieved. respectively. (A) The volume of interest (VOI) highlighting the two NanoCT layers shown in (B, blue frame) and (C, orange frame). (B, C) Representative single NanoCT sections as given in the VOI of (A). (B) and (C) are positioned orthogonal to each other. One recognizes the orientation of the BC network formed by the hepatocytes, d. H. A more horizontal arrangement can be seen in (B) and a more vertical orientation in (C). The thickness of the NanoCT layer is 580 nm. (D) Representative histological slide with a thickness of 3 μm. m obtained from the same mouse liver lobule specimen after the hematin-based dye was applied and embedded in a paraffin block. Photo credits: Scientific Reports Doi: https://doi.org/10.1038/s41598-018-36067-y. To compare staining efficiency, the mouse liver globule tissue was imaged prior to staining with microCT, followed by imaging according to the hematin protocol. The staining process was done in two steps and the desired contrast enhancement was achieved as expected after staining. The results were observed using the microCT overview to show different anatomical structures including the vascular system. 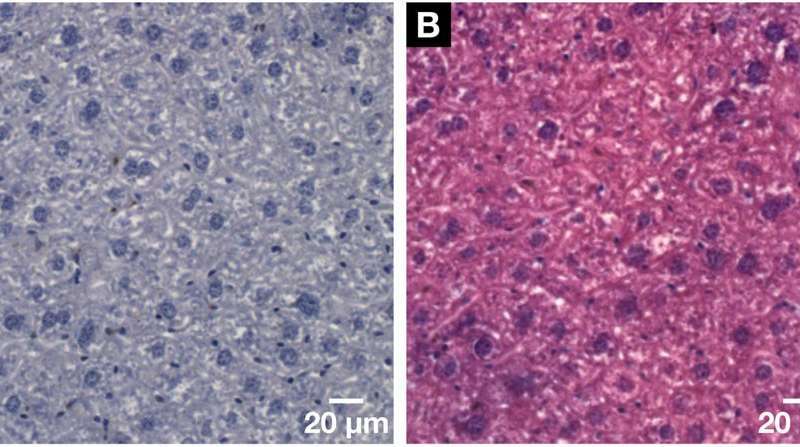 In contrast to the previous examples in large liver tissue samples, staining was homogenous throughout the mouse liver lobe. The 3D imaging process allowed access to a range of CT slices at any level. In contrast to conventional 2D histology (with paraffin-embedded soft tissue), soft tissue could be viewed from different angles. Next, the tissue was examined at subcellular level with smaller pieces of the same lobe of the liver. which were dissected and analyzed with nanoCT. The visualized results showed areas of volume of interest (VOI), nuclei of hepatocytes and nuclei of other cell types (Kupffer cells and sinusoidal endothelial cells). Black whole structures represented the bile canal channel network (BC), while the darker gray values ​​showed the cytoplasm of the liver tissue sample. The orientation of the BC network was also observed. The tissue was then examined with conventional histology using very thin slides, with no other staining except for hematin-based staining. The conventional technique similarly confirmed the morphology of hepatocytes and other cell types (in dark purple stained nuclei) while the BC network was stained white. 3D nuclei and analysis of various cell nuclei present in mouse liver volume of interest (VOI). Photo credits: Scientific Reports Doi: https://doi.org/10.1038/s41598-018-36067-y. The scientists confirmed the accuracy of 3D reconstruction reconstruction in the study with previous investigations. When the hematin-based method was reapplied in conventional 2D histology studies, the scientists also applied a standard counterstain, Eosin Y-specific, to the cell cytoplasm on the tissue. In the results, the nuclei remained purple, while the cytoplasm received the pink spot. In this way, the scientists have demonstrated the hematin-based core-specific staining capacity, even with standard histology. 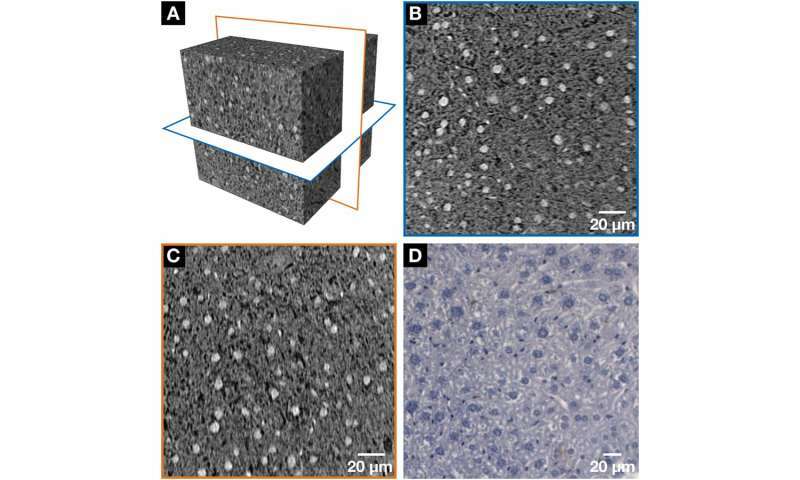 Demonstration of the histological compatibility of the hematin-based staining method with conventional 2D histology developed for X-ray MicroCT and NanoCT. (A) Representative histological slide with a thickness of 3 μm. m obtained from the same mouse liver lobule specimen after staining and hematin-based embedding in a paraffin block. Clear visualization of the larger hepatocyte nuclei and smaller nuclei, such as Kupffer cells and dark purple SECs and the white BC network. (B) Compatibility with the standard counterstain of Eosin Y was shown on a subsequent slide seen in (A). The cell nuclei are shown in purple next to the cytoplasm in pink, resulting in a typical H & E-stained microscopic slide of a soft tissue sample. Photo credits: Scientific Reports Doi: https://doi.org/10.1038/s41598-018-36067-y. The hematin-based staining protocol supported high-resolution CT visualization of cell nuclei in submicron soft tissues, which was previously not possible with other staining techniques combined with microCT technology. Future histopathological studies may be able to eliminate time-consuming preparation procedures and the loss of tissue samples (as seen in standard histology) for obtaining individual tissue sections by 3D examination of an entire VOI, as demonstrated in the present study. Being able to screen a larger sample for abnormal nuclei could help pathologists identify areas of inflammation to assess the etiology and progression of the disease. The staining protocol is simple and reproducible, suitable for whole organ CT staining coupled with 3D visualization and non-destructive analysis of soft tissue samples. The colorants listed in the protocol are readily available, while CT-compatible X-ray compatible protocols provide better complexity for the analysis of soft tissue samples. The staining protocol steps require further optimization with various tissue types and in various applications, including 3D histology, developmental and structural biology studies in the laboratory. 3. X-ray microtomographic image of intact vertebrate embryos www.ncbi.nlm.nih.gov/pubmed/22135670, Metscher B.D. et al. December 2011, Cold Spring Harbor Protocol.